I finally felt like getting back into writing in my blog again. I’ve had one, with a few spaces and in a few different places, since 2000. This week I played with the look and was ready to blog. But what to write about? All was saved when I came across Loobylu’s What’s Hot + What’s Not Wednesday by way of the fabulous Pip from Meet Me At Mike’s. Ah, perfect way to get back into things! Seeing my Mum and Dad on the weekend and spending some quality time with them, along with my husband (who they love as a son, aww bless!). I really miss my Mum and Dad and really enjoy visiting with them and sharing some lovely long chats, laughs and some good food. I will also get to see Max, my gorgeous black Kitty who my parent’s very kindly look after for me (we can’t have pets here, sadly) and have some quality Maxie snuggling time; and also my parent’s cat Pearl, who is anyone’s friend as long as you pat her. A lot. Having lots of fun things on and around my desk. Above you can see two of those things; my Hula doll that I found at a local op shop and could not resist as she is retro and reminds me of the game Fallout 3, and my be-sequined vodka bottle, sadly empty. I cannot resist the sparklies. Enjoying my holiday time away from Tafe. I’m currently studying to be a library technician and as much as I enjoy the course (especially cataloguing, much to my classmates disbelief) I am loving the time off and not having to think about assignments. Well, at least not until tomorrow. The fact that it is getting close to christmas which means I can go nuts with decorations + crafting +baking. I’m already itching to get out the christmas tree. We have two – one green plastic tree, standard height and one small white tree which I love as it looks very retro. I have been collecting vintage christmas baubles and love looking at them. I like ones like this. Photos of my collection to come soon. Having good things to watch on tv. This includes Costa’s Garden Odyssey, River Cottage Spring and Torchwood Season 2. The fact that it is back to Tafe next week – boo! I like the course itself, just not keen on the social politics and cliques within the student groups, not to mention having to travel on city rail trains. I have not done any crafting yet. This is bad. I envisioned myself being so utterly crafty and creative on my holidays. I really need to get over the perfectionist aspect of my personality so I just start projects and enjoy the process, rather than getting stuck on the idea that I might ruin materials or do something wrong. Issues, I haz them. There is a pile of laundry that I need to sort, fold and put away. I would enjoy that task if we had more wardrobe/drawer space. We have a lack of it, mainly, because I cannot control myself in op shop clothing sections. And can’t throw things away as “it might be useful one day!”. Hmmm. I know what you mean about TAFE, I’m enjoying most of the course, but some of the other students and some of the subjects drive me insane. Yeah, lots of student clique crap not to mention the general “I am an idiot and am going to ask the most basic question”…”in EVERY class every week”. sigh. I hated information literacy that was basically ‘how to use/search the internet’. That almost made me lose the will to live. Somehow I reckon I’d be more than happy to swap the Mt Washing around here for yours! Five days of rain forecast too. The middle kid went to school in his bathers today for lack of clean undies (again). 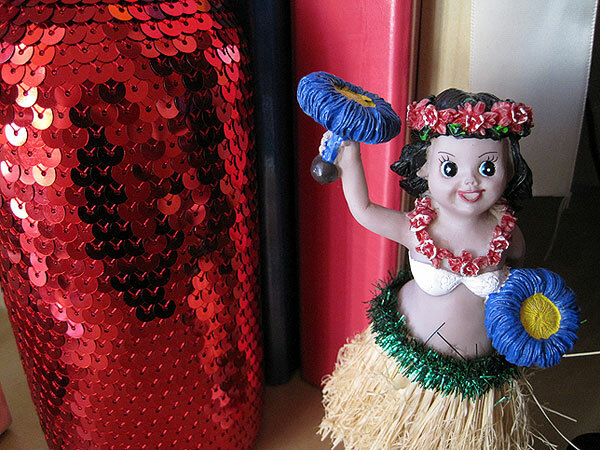 Love the photos of your hula girl, sequence covered bottle and the old Christmas decorations. I am looking forward to seeing some more, I might post some of my most treasured decorations too! You are not the lone ranger! Social politics and cliques really get to me too sometimes and can undermine your confidence leaving you searching your self for faults. But (on my good days) I feel that it is these people who do not/can not relate to anyone who does not fit their mould. Do get on the craft wagon and make mistakes, its ok…it happens with me too. It seems I have learnt more from my mistakes in life that through any other method… It will help you deal with your issues.